A DISABLED man who sent his former carer more than 1400 text messages and called her 300 times in 10 days told her he would "skin her alive in salt water" when she didn't respond. The Maroochydore Magistrates Court heard how the former carer of Anthony Dennis Costin, 22, had to change her phone number, delete social media and became anxious in public after receiving threats and derogatory messages from him last year. Police prosecutor Mark Burrell said the woman came to police in January about the persistent contact from Costin since leaving her job as his carer. Mr Burrell said the woman kept in contact with Costin, who was a quadriplegic, but when his advances weren't mirrored, he became agitated. The court heard Costin sent messages at all hours of the day and night, including to "skin her alive", "ruin her career" and "go back to Adelaide or die". 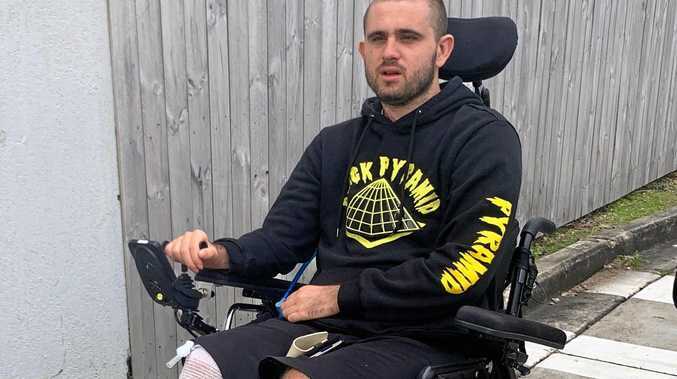 Defence lawyer James Allen said Costin suffered serious emotional turmoil after a spinal accident two years ago which left him quadriplegic and completely reliant on others. Mr Allen said Costin developed a "strong bond" with his former carer and reacted poorly after he "sought more than she was willing to give". While Mr Allen argued Costin didn't have the capacity to carry out his threats, he was still coming to terms with his accident. The court heard Costin required constant care and getting ready to leave his house took at least three hours, which Mr Allen said highlighted the burden he would put on the prison system. Magistrate Rod Madsen said these types of stalking offences had "unimaginable impacts" on their victims, before reading out extracts from a victim impact statement provided by the woman. "Since that day I have suffered from anxiety and stress," he read from the statement. Mr Madsen said the victim was still anxious whenever her phone rang, scared it might be Costin. He considered Costin's disability and emotional stress but said it "doesn't excuse what you did". Costin was sentenced to two years jail, wholly suspended for five years.